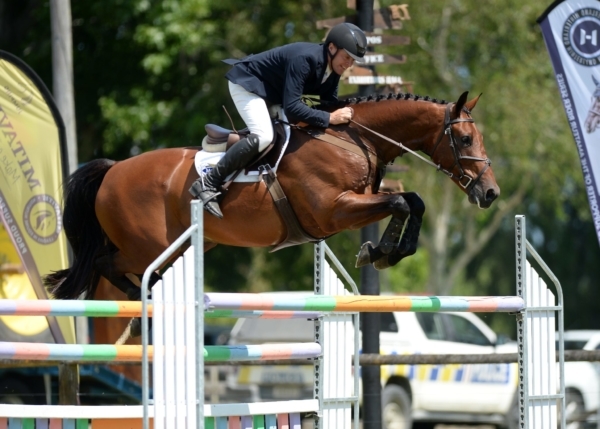 It’s been a big weekend of equestrian in Wairoa with their annual back-to-back shows. True to form, their hard working committee moved heaven and earth to ensure all competition was on good ground after the area was drenched with 125mls of rain from Tuesday night through to Thursday morning. It meant Wednesday’s dressage had to be cancelled to preserve the grounds for the jumping. Winner of the Wairoa A&P Show’s Equissage Horse Grand Prix, Simon Wilson (Waipukurau) couldn’t speak highly enough of the efforts that went into ensuring successful shows. “They did all they could, moving jumps and arenas around so that everyone had good going,” said Simon. All of the Wilson family enjoyed various successes at the show, with Simon taking out the horse grand prix aboard McMillans Ariados. The combination were the only ones clear in the opening round over the John Vallance (Australia) designed course. But expecting a win is never something he dares to do. Since he joined the Wilsons, Simon too has been taking things quietly with the nine-year-old gelding, starting him at 1.15m-1.2m levels. His victory in the horse grand prix at the Wairoa A & P Show was his first at that level. The Country TV Pony Grand Prix at both the A&P Show and the Wairoa Branch of the Northern Hawke’s Bay Area of ESNZ Show were both great classes. Ally Stevenson (Hastings) and Jakaranda took the honours with the only double clear from the eight starters at the Wairoa A&P Show. Emma Noble-Campbell (Tuakau) and Whakapirau Cherry Ripe, the only other combination to come through to the jump-off, gave them a good nudge but took the last to finish second. In the Wairoa ESNZ Show, the pony grand prix produced a fantastic class. The top three were all double clear producing an exciting five strong jump-off which saw Brooke Hawthorne (Cambridge) and Easy As the victors with their 28.33 second time. Dylan Bibby (Onga Onga) and Daisy Patch were second in 30.78 with Lucy Buchanan (Hastings) and Redcliffs Colour Me Quick just a smidgen behind in 30.95 seconds. Many trucks are now heading to Gisborne for the Larsen Sawmilling North Island Jumping and Show Hunter Championships which get underway on Friday. Equissage Horse Grand Prix: Simon Wilson (Waipukurau) McMillans Ariados 1, Fraser Tombleson (Gisborne) Mea I 2, Helen Kippen (Ocean Beach) Velocity NZPH 3, Sarah West (Matamata) Oaks Centurian 4, Geordie Bull (Taupo) Forest Hill 5, Claire Wilson (Waipukurau) McMillans Chuck 6. Country TV Pony Grand Prix: Ally Stevenson (Hastings) Jakaranda 1, Emma Noble-Campbell (Tuakau) Whakapirau Cherry 2, Lucy Buchanan (Hastings) Redcliffs Colour Me Quick 3, Amelia Paull (Gisborne) Envious Edition 4, Dylan Bibby (Onga Onga) Daisy Patch 5, Keira Page (Auckland) Redcliffs Colour Me In 6. FMG Young Rider Series: Sarah West (Matamata) Oaks Centurian 1. Dunstan Horsefeeds & Equifibre Junior Rider Series: Brooke Hawthorne (Cambridge) Deimos 1, Molly Goodisson (Havelock North) Mustangs Edition 2, Molly Goodisson (Havelock North) Darkages 3, Anna Rasmussen (Havelock North) Expozay 4, Tim Wilson (Waipukurau) McMillans Tipsey 5, Mackenzie Parker (Auckland) Airoso 6, Claudia Thomas (Rotorua) Airborne MVNZ 7. Hinterland Amateur Rider Series: Marcus Rose (Dannevirke) Kaipara Hold UP 1, Graeme Isaacson (Waipukurau) Pokere 2, Larina Dolman (Gisborne) Floriant DHU 3, Sofie Dever (Gisborne) Two Face 4, Amelia Shotter (Dannevirke) Dallas NZPH 5, Simone McConnell (Tauranga) Country Zena 6. Main-Events University Series: Brianna Donlon (Rotorua) Weiti Drama 1. Matthews Hanoverians Seven-Year-Old Series: Amanda Pottinger (Havelock North) Good Timing 1, Ashley Hart (Hastings) Kiwi Cheroso 2. Mitavite Speedi-Beet Six-Year-Old Series: Ashley Hart (Hastings) Kiwi Centrokee and Jesse Linton (Hastings) LT Holst Elsbeth -1. East Coast Performance Horses Five-Year-Old Series: Noni Morgan (Hastings) Jemma 1. Country TV Pony Grand Prix: Brooke Hawthorne (Cambridge) Easy As 1, Dylan Bibby (Onga Onga) Daisy Patch 2, Lucy Buchanan (Hastings) Redcliff’s Colour Me Quick 3, Keira Page (Auckland) Redcliffs Colour Me In 4, Emma Noble-Campbell (Tuakau) Whakapirau Cherry Ripe 5, Keira Page (Auckland) Redcliffs Kodak Moment 6. Mitavite Speedi-Beet Six-Year-Old Series: Fraser Tombleson (Gisborne) Sentra, Ashley Hart (Hastings) Kiwi Centrokee and Amelia Shotter (Dannevirke) Dallas NZPH =1. East Coast Performance Horses Five-Year-Old Series: Jenna-Lee Rose (Dannevirke) Silent Witness 1. Hinterland Amateur Rider Series: Marcus Rose (Dannevirke) Kaipara Hold UP 1, Lucy Win-Hewetson (Gisborne) Karakia 2, Merran Hain (Gisborne) Untouchable 3, Lidy Loffler (Gisborne) Parafino 4, Graeme Isaacson (Waipukurau) Pokere 5, Larina Dolman (Gisborne) Floriant DH 6. Dunstan Horsefeeds and EquiFibre Junior Rider: Brooke Hawthorne (Cambridge) Deimos 1, Molly Goodisson (Havelock North) Mustangs Edition 2, Sarah West (Matamata) LC Talent 3, Molly Prenter (Havelock North) Wenrose Vertigo 4, Tim Wilson (Waipukurau) McMillan’s Tipsey 5, Ella Harkness (Napier) Kiwi Mildee 6. FMG Young Rider Series: Sarah West (Matamata) Oaks Centurian 1, Molly Goodisson (Havelock North) Darkages 2. Corson Horse Mini Prix: Geordie Bull (Taupo) Forest Hill 1, Helen Kippen (Ocean Beach) Velocity NZPH 2, Thibaut Damas (Cambridge) Oaks Centurion 3, Trudi Mitchell (Wairoa) LC Autograph 4, Ashley Hart (Hastings) Kiwi Showtime 5, Claire Wilson (Waipukurau) McMillans Chuck 6. Cartown Cat A HOYQ High Points 70cm: Molly MacLachlan (Te Kuiti) Greenlee Calypso 1, Isobel Jayne Bevitt (Gisborne) Buffalo Man 2, Abbey Strang (Waipawa) Du Ciel 3, Sam Brooks (Gisborne) Goldenwillow Romeo 4. Burger King Cat B HOYQ High Points 80cm: Ella Rouse (Gisborne) Ruby Tunes 1, Anna Devescovi (Havelock North) Ellangowan Stevie Nicks 2, Hannah McConnell (Tauranga) Billy Blunt 3, Kate Shaw (Takapau) Benmore Pizzazz 4, Jack Calder (Norsewood) Llyod 5, Wiremu Priest (Rotorua) Freestyle Aurora 6. Aniwell Cat C HOYQ High Points 90cm: Jady Fahy (Rotorua) Freestyle Apple Jack 1, Lily Beaufoy (Gisborne) Iamwhatiam 2, Lucy Buchanan (Hastings) Just Indi 3, Ella Kelso (Gisborne) Pine Hollow MJK Swiper 4, Hannah von Dadelszen (Waipukurau) Star Waka 5, Luchia Wynne-Lewis (Hastings) Maxwellton Friday Flash 6. ESNZ Pony Rider Equitation Series: Anna Devescovi (Havelock North) Ellangowan Stevie Nicks 1, Zara Main (Waitoki) Acclaim 2, Janey Pease (Piopio) My Cats Pyjamas 3, Ella von Dadelszen (Waipukurau) Star Waka 4, Karma Matenga (Gisborne) Hot Ice 5, Luchia Wynne-Lewis (Hastings) Maxwellton Friday Flash 6. Combined Gyro Plastics Junior Hunter and The Ultimate Egg Co Amateur Hunter Competition: Caroline Coop (Gisborne) Budgie 1, Tristan Thomas (Rotorua) Airborne MVNZ 2, Larina Dolman (Gisborne) Kiwi Lansing 3, Merran Hain (Gisborne) Untouchable 4, Zoe Strawbridge (Central Hawke’s Bay) Ngahiwi Mary Holden 5, Lucy Win-Hewetson (Gisborne) Tangaroa 6. Combined ESNZ Junior and Adult Rider Equitation Series: Tristan Thomas (Rotorua) Airborne MVNZ 1, Zoe Strawbridge (Central Hawke’s Bay) Ngahiwi Mary Holden 2, Ashleigh Forde (Hastings) My Gummi Bear 3, Molly Goodisson (Havelock North) Mustangs Edition 4, Lindsay Averill (Hastings) Almost Overcast 5, Sally Newall (Napier) Dark Secret 6. NRM HOYQ High Points Series: Jesse Linton (Hastings) LT Holst Elsbeth 1, Larina Dolman (Gisborne) Floriant DHU 2, Merran Hain (Gisborne) Untouchable 3, Holly Baines (Gisborne) Halo 4, Larina Dolman (Gisborne) Kiwi Lansing 5, Molly Goodisson (Havelock North ) Mustangs Edition 6. Combined Gyro Plastics Junior Hunter and The Ultimate Egg Co Amateur Hunter Competition: Merran Hain (Gisborne) Untouchable 1, Tristan Thomas (Rotorua) Airborne MVNZ 2, Ashleigh Forde (Hastings) My Gummi Bear 3, Lucy Win-Hewetson (Gisborne) Tangaroa 4, June Berrington (Whakatane) Kiwi Iron Mark 4, Zoe Strawbridge (Central Hawke’s Bay) Ngahiwi Mary Holden 6. Combined ESNZ Junior and Adult Rider Equitation Series: Tristan Thomas (Rotorua) Airborne MVNZ 1, Ashleigh Forde (Hastings) My Gummi Bear 2, June Berrington (Whakatane) Kiwi Iron Mark 3, Zoe Strawbridge (Central Hawke’s Bay) Ngahiwi Mary Holden 4, Janey Pease (Piopio) Roxy 5. NRM HOYQ High Points: June Berrington (Whakatane) Kiwi Iron Mark 1, Ashleigh Forde (Hastings) My Gummi Bear 2, Merran Hain (Gisborne) Untouchable 3, Tristan Thomas (Rotorua) Airborne MVNZ 4, Holly Baines (Gisborne) Halo 5. Cartown Cat A HOYQ High Points: Isobel Jayne Bevitt (Gisborne) Buffalo Man 1, Molly MacLachlan (Te Kuiti) Greenlee Calypso 2, Abbey Strang (Waipawa) Du Ciel 3. Burger King Cat B HOYQ High Points: Hannah McConnell (Tauranga) Billy Blunt 1, Monica McConnell (Tauranga) Game Keeper 2, Ella von Dadelszen (Waipukurau) Matai SB 3, Anna Devescovi (Havelock North) Ellangowan Stevie Nicks 5, Zara Main (Waitoki) Acclaim 6. Aniwell Cat C HOYQ High Points: Lily Beaufoy (Gisborne) Iamwhatiam 1, Hannah von Dadelszen (Waipukurau) Star Waka 2, Jade Fahy (Rotorua) Freestyle Apple Jack 3. ESNZ Pony Rider Equitation Series: Ella von Dadelszen (Waipukurau) Star Waka 1, Ella Rouse (Gisborne) Ruby Tunes 2, Anna Devescovi (Havelock North) Ellangowan Stevie Nicks 3, Zara Main (Waitoki) Acclaim 4, Janey Pease (Piopio) My Cats Pyjamas 5, Tessa Harre ( Waikato) Capesthorne Park 6.